(2018) "Til I Found You"
"Living Hope" is a song by American contemporary Christian musician Phil Wickham. The song was released as the lead single from the album of the same name on March 30, 2018. It impacted Christian radio on May 11, 2018. The song peaked at No. 10 on the US Hot Christian Songs chart, becoming his third Top 10 single. Wickham co-wrote the song with Brian Johnson, and collaborated with Ed Cash, and Jonathan Smith in the production of the song. The song is played in a E-flat major key, and 143 beats per minute. "Living Hope" was released as the lead single from his seventh studio album of the same name on March 30, 2018. Wickham announced the single's release coinciding with Good Friday and Easter holidays. Wickham wrote “Living Hope” with Bethel Music’s Brian Johnson through text. Johnson sent him a voice memo for the melody, with the two sending their ideas back and forth until it was finished. Wickham describes what the track means to him in a video, "God has rescued us from a place that we could never have rescued ourselves. Our future was death, but Jesus came in and brought life – a living hope – into our souls and into our lives. I love singing the truth of 'Living Hope,' and this song has already become an anthem at both of the churches where we lead. I hope anybody who gets to hear it not only sings along, but their hearts’ cling to it as well." "Living Hope" is originally in the key of E-flat major, with a tempo of 143 beats per minute. Written in common time, Wickham's vocal range spans from E4 to A5 during the song. It debuted at No. 35 on the Hot Christian Songs chart. The song left the chart before re-entering on the issue week of January 5, 2019. The song reached the Top 10 after thirty-six weeks, at its peak of No. 10. The track became his third Top 10 on the chart, since "This Is Amazing Grace" in 2014. It debuted at No. 24 on the Billboard Christian Airplay chart on the issue week of June 30, 2018. After a long, twenty-four week climb, it finally reached the Top 10, peaking at No. 9. It lasted 38 weeks on the overall chart, becoming his second longest charting song. The music video for the single "Living Hope" was released on March 29, 2018. The video features Wickham and his band performing the track in dimly lit room. Bethel Music released a live version of the song, led by Bethany Wohrle as a single. Bethel Music released a duet cover of the song, led by Brian Johnson and Jenn Johnson, on their collective album, Victory (2019). ^ "Living Hope - Phil Wickham on Spotify". Spotify. Spotify. March 30, 2018. Retrieved January 17, 2018. ^ "Living Hope - Single by Phil Wickham". iTunes. March 30, 2018. Retrieved January 17, 2019. ^ a b Andre, Joshua (March 30, 2018). "Phil Wickham – Living Hope (Single) | 365 Days Of Inspiring Media". 365 Days Of Inspiring Media. Retrieved September 26, 2018. ^ "Phil Wickham – Living Hope". DailyMPE. DailyMPE. March 30, 2018. Retrieved January 17, 2019. ^ "Hillsong Worship's 'Who You Say I Am' Tops Christian Airplay Chart". Billboard. January 16, 2019. Retrieved January 17, 2019. ^ "Living Hope - Phil Wickham Sheet Music | PraiseCharts". PraiseCharts. PraiseCharts Publishing, Inc. Retrieved January 17, 2018. ^ "Living Hope - Phil Wickham | Credits | AllMusic". AllMusic. All Media Network. Retrieved January 17, 2019. ^ a b "Key & BPM for Living Hope by Phil Wickham". Tunebat. March 23, 2018. Retrieved January 17, 2019. ^ "Living Hope - Single by Phil Wickham on Apple Music". Apple Music. United States. Apple Inc. March 30, 2018. Retrieved January 17, 2019. ^ "Phil Wickham's "Living Hope" is a beautiful 21st-century hymn". Aletia. September 12, 2018. Retrieved January 17, 2019. ^ Wickham, Phil (March 30, 2018). "Living Hope By Phil Wickham". Musicnotes.com. Retrieved January 18, 2019. ^ "Music: Christian Music Chart - Billboard Chart". billboard.com. Retrieved January 17, 2019. ^ "Hot Christian Songs February 9, 2019". Billboard. February 6, 2019. Retrieved February 6, 2019. ^ "Living Hope Phil Wickham, Daywind". DayWind.com. Retrieved January 17, 2019. ^ "Living Hope - Phil Wickham TIDAL". Tidal. Retrieved January 17, 2019. ^ "Living Hope (House Sessions)". iTunes. Retrieved January 17, 2019. ^ "Phil Wickham - Living Hope (Official Music Video)". YouTube. Retrieved January 17, 2019. 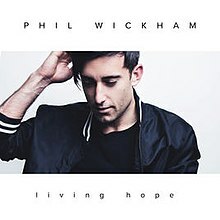 ^ "New Single from Phil Wickham - "Living Hope"". MultiTracks. April 6, 2018. Retrieved January 17, 2019. ^ "Living Hope: Bethel's Bethany Worhle releases single". Cross Rhythms. July 26, 2018. Retrieved January 21, 2019. ^ Yap, Timothy (January 21, 2019). "Bethel Music "Victory" Album Review : Exclusives : Hallels". Hallels. Retrieved January 27, 2019. Those who already own Phil Wickham's latest album will immediately warm up to "Christ is Risen" and "Living Hope." Since both songs were co-written with Brian Johnson, it's no surprise that they resurface here. Frankly, Johnson's version of "Living Hope" overshadows Wickham's, thanks to Jenn Johnson who brings a veneer of passion to the song's second verse. ^ "Phil Wickham Chart History (Hot Christian Songs)". Billboard. Retrieved January 17, 2019. ^ "Phil Wickham Chart History (Christian Airplay)". Billboard. Retrieved January 17, 2019. ^ "Phil Wickham - Christian AC History". Billboard. Retrieved January 17, 2019. ^ "Christian AC Indicator". Billboard. Prometheus Global Media. Retrieved January 17, 2019. ^ "Christian Airplay - Year-End 2018 - Billboard". Retrieved January 17, 2019. ^ "Hot Christian Songs – Year-End 2018". Billboard. Retrieved January 17, 2019. This page was last edited on 20 March 2019, at 12:10 (UTC).